A recent US State Department official recently evaluated the Roca Blanca Spanish Language School to be in the safest and most secure area in all of Mexico, well-patrolled, virtually free from the drug and other violence issues that are plaguing Mexico’s border towns and some large cities. This is good news for serious language learners who want the element of cultural integration among Mexico’s indigenous without being exposed to unnecessary risk. The Spanish school runs year round, has multicultural staff, students from many backgrounds and countries, and in a highly multicultural area. 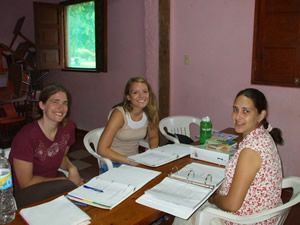 There are tons of opportunities to practice everything that you learn, especially since the Spanish school is located on a campus that also houses a Bible school, music school, vocational school, high school, and a medical clinic. Seasoned missionaries and Mexican coworkers complete the panorama. Come take advantage of all that we offer you as part of God’s plan for much fruit and fruit that remains!